The newly developed device, an epidermal electronic system created by an international team of engineers and scientists. Through a combination of careful theoretical modeling and precise micro-manufacturing, a team of engineers and scientists has developed a new type of ultra-thin, self-adhesive electronics device that can effectively measure data about the human heart, brain waves and muscle activity--all without the use of bulky equipment, conductive fluids or glues. One of the advantages of the newly created epidermal electronic systems is easy on / easy off application. As this video shows, the electronics have the right physical propertie--such as stiffness, bending rigidity, thickness and mass density--to perfectly match to the epidermis. The systems seamlessly integrate and conform to the surface of the skin in a way that is mechanically invisible to the user, and the devices have the potential to provide a range of healthcare and non-healthcare related functions. The researchers have created a new class of micro-electronics with a technology that they call an epidermal electronic system (EES). They have incorporated miniature sensors, light-emitting diodes, tiny transmitters and receivers and networks of carefully crafted wire filaments into their initial designs. The technology is presented--along with initial measurements that researchers captured using the EES--in a paper by lead author Dae-Hyeong Kim of the University of Illinois and colleagues in the Aug. 12, 2011, issue of Science. The EES device was developed by collaborators from the University of Illinois at Urbana-Champaign, Northwestern University, Tufts University, the Institute of High Performance Computing in Singapore, and Dalian University of Technology in China. "Our goal was to develop an electronic technology that could integrate with the skin in a way that is mechanically and physiologically invisible to the user," says corresponding author John Rogers, a professor in materials science and engineering department at the University of Illinois at Urbana-Champaign. "We found a solution that involves devices we designed to achieve physical properties that match to the epidermis itself. It's a technology that blurs the distinction between electronics and biology." While existing technologies accurately measure heart rate, brain waves and muscle activity, EES devices offer the opportunity to seamlessly apply sensors that have almost no weight, no external wires and require negligible power. Because of the small power requirements, the devices can draw power from stray (or transmitted) electromagnetic radiation through the process of induction and can harvest a portion of their energy requirements from miniature solar collectors. The EES designs yield flat devices that are less than 50-microns thick--thinner than the diameter of a human hair--which are integrated onto the polyester backing familiar from stick-on tattoos. The devices are so thin that close-contact forces called van der Waals interactions dominate the adhesion at the molecular level, so the electronic tattoos adhere to the skin without any glues and stay in place for hours. The recent study demonstrated device lifetimes of up to 24 hours under ideal conditions. 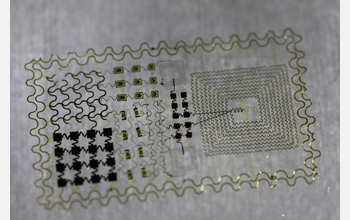 "The mechanics behind the design for our serpentine-shaped electronics makes the device as soft as the human skin," says Northwestern University engineer Yonggang Huang, also a lead researcher on the project. "The design enables brittle, inorganic semiconductors to achieve extremely vast stretchability and flexibility. Plus, the serpentine design is very useful for self adhesion to any surface without using glues." While some areas of the body are ill-suited to adhesive electronics, such as the elbow, most regions commonly targeted for medical and experimental studies are ideal, including the forehead, extremities and the chest. Regions of the body that previously proved difficult to fit with sensors may now be monitored, including the throat, which the researchers studied to observe muscle activity during speech. The throat experiment yielded enough precision for the research team to differentiate words in vocabulary and even control a voice-activated video game interface with greater than 90 percent accuracy. "This type of device might provide utility for those who suffer from certain diseases of the larynx," adds Rogers. "It could also form the basis of a sub-vocal communication capability, suitable for covert or other uses." The current innovation builds upon six years of collaboration between Rogers and Huang, who had earlier partnered to develop flexible electronics for hemispherical camera sensors and other devices that conform to complex shapes. "This work is really just beginning," adds Rogers. "On the technology side, our focus is on wireless communication and improved solutions for power-such as batteries, storage capacitors and mechanical energy harvesters-to complement the inductive and solar concepts that we demonstrate in the present paper." The researchers are also exploring clinical approaches, particularly for ailments where sensor size is critical, such as sleep apnea and neonatal care. Much further into the future, the researchers hope to incorporate microfluidic devices into their technology, opening up a new arena of electronic bandages and enhanced-functioning skin, potentially accelerating wound healing or treating burns and other skin conditions. The research was supported by the National Science Foundation through the grants OISE-1043143, CMMI-0749028 and ECCS-0824129 and the United States Air Force, Department of Energy and Beckman Institute. The National Science Foundation (NSF) is an independent federal agency that supports fundamental research and education across all fields of science and engineering. In fiscal year (FY) 2011, its budget is about $6.9 billion. NSF funds reach all 50 states through grants to nearly 2,000 universities and institutions. Each year, NSF receives over 45,000 competitive requests for funding, and makes over 11,500 new funding awards. NSF also awards over $400 million in professional and service contracts yearly.